Ok I get it, it’s really fun to play! But I think I would install it because of the fact you have to pay for it. So I definitely hate this game. I thought it was going to be fun until it said I had to pay. I don’t recommend it. I deleted this app months ago & I never bought anything. Why is it taking money out? We drum - very fun! Great little ap- lots of fun!!!!! I don’t know if anybody else had this problem, but I tried the to go onto AR mode in the song selection. Nothing happens and after I tapped it. I don’t the subscription and nothing happened after I clicked it. I realized that you probably need the subscription, but then I thought there would at least be a message. Overall, the game is basically a billboard. They shove adds and messages to subscribe. Honestly, if you want a music game just get Guitar Hero. I want to cancel my subscription. I have an ACTUAL kit at home that I feel like costs less than this app. Can’t find a way to cancel?? Please help. Entirely too pricey. Arrogant pricing for an entertainment based game. All it wants you to do is pay for everything. You only get to play one song free. The opening page to the app is “get the free trial now!”. 🙄It’s SO ANNOYING! careful when you click any buttons or you will get auto subscrption with your money. Said I was starting a 14 day trial but only gave me a 3 day trial when I clicked the button, which is enough on its own for a bad review to bait and switch. BUT I still gave it a shot. There is only one well known song. Not fun at all. I’m already bored with it and am cancelling. Certainly not worth $7.99 a month. Hi!I saw an ad for this and thought I should buy this!I do enjoy this but I don’t like how they ask you to pay for almost anything! It’s fun and educational because it teaches simple beats that can be used for multiple songs. Very fun and creative! My little cousin loves it! Never even got to play it because the minute I opened the app a pop up comes up and wants to charge me for the app at $7.99 a week. Anyone who is zooming through this fast may overlook this and start playing and never realize they were charged. Honestly that’s probably how this app gets most of its money, from people not paying attention. And why would you? The app is free to download but not free to play? There are plenty of free drum apps out there, use those. App tries to trick you into signing up for a free trial using in app purchase. If you agree you will start getting charged. 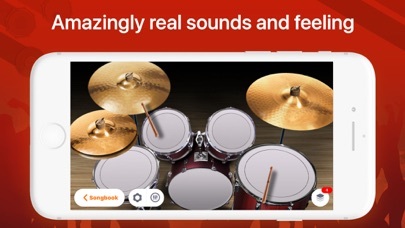 App makes it difficult to go to the main non-premium drum set without deceiving prompts pushing you to the in app purchase. Apple should not allow this practice it is dishonest. This game would be really very great but I literally can’t pay $8 a week for it. I just had back surgery and can’t work so I guess I’m out of luck. The amount of begging for money is outrageous. You get access to like 3 songs if you don’t spend any of your money. And it’s subscription based??? Who in their right mind is going to pay (a very generous amount of) money every week/month/whatever to play a game that isn’t even that good? You can spam click the buttons and get a perfect score, as there isn’t a penalty system in which you lose points for hitting the drum when you’re not supposed to. This is a mediocre game. Even if you didn’t have to pay for anything and everything was unlocked and free, it’s drill mediocre. 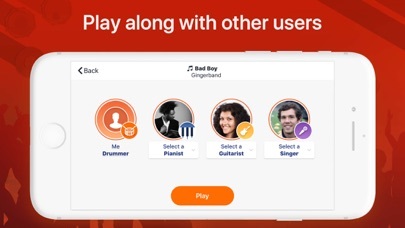 Download garage band or any free drum app for just as good of an experience for no cost. Poor song selection, no actual songs, just some traditional, royalty-free stuff. AR mode sounds like fun, but It’s so buggy, it’s unplayable. The gameplay itself is too easy and repetitive, it’s neither challenging nor educational. And the price is just a joke. 32$ a month?Seriously? Just be careful, it’s one week free trial, but they will charge you 8$ at the beggining of week 2, unless you unsubscribe. MONEY MONEY MONEY. This is a horrible game. Absolutely everything wrong with apps these days. Expect people to pay for terrible mechanics, lack-luster content, and limited gameplay. Not sure how this game is sitting at 4.4. It’s unplayable. This should be a game where u don’t have to pay to play. Absolutely terrible. It’s charging me $8 for absolutely nothing I unsubscribed and deleted the app it’s still charging me. Too soon to tell when a review is forced after only half a song. This is awesome it helps me learn alot!!! My granddaughter thinks it’s fun. This game has potential but here are a couple of problems. Never heard of the songs...the game continues on even when an add is playing and the sound effect that are made when you hit a milestone is VERY distracting. I will continue to adjust me rating with every version. For now, 2 stars is about it. what is happening with the price of apps? I understand they aren’t cheap to develop. But video games are less. Nice app, but I delete it, anyway my CC was charge it... why? I have just barely gotten through the tutorial and I am be forced to either like it or not. Not cool!! This app is very nice. 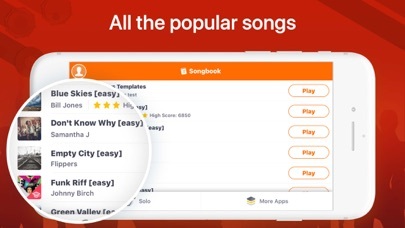 It allows you to have top notch music for a price, but unlike most other apps you can also play it for a free limited version. This is very nice for people who just want to play for fun. Pretty fun. Could actually help beginning musicians with basic rhythm at the least. Regretted downloading it right away. The free songs are garbage and there is NO way it’s even close to worth anything beyond $0.50/month. Songs are less than a minute long and followed buy 2 minutes of ad’s. Terrible app. Not worth the download time. Forces you to sign up for a subscription that isn’t simple to cancel that most people will forget about and either pay once or multiple times before realizing their mistake. Don’t waste your money. Don’t support this manipulative set up. Better options for phone drums are out there. I only give it one star because it goes fast and I got a little confused, I still think it’s a pretty good app and others would enjoy it if they don’t really mind having a little bit of sore fingers.. I hate how apps make it so you have to pay the full version for pretty much anything like club penguin, drum pads go, roblox and this game i understand you need money but like why the hell cant I just play my song in peace like seriously! I get how a drum kit works, so not being able to skip the drawn out useless tutorial was a bummer, but fine, most apps do this Finished the tutorial, they trick you into going to a subscription page “(restart) (songbook) (FREE TRIAL)” last one colored in. Going into the free trial requires you to start a subscription, even if they won’t charge you in the first 7 days. Finally getting away from that, they ask immediately for a review - as if you want my review that quickly. Going through the songbook, it’s very limited, and they make it difficult to find the free to play tracks. Most of which are unknown songs, or child songs. Maybe a few drum patterns. The VIP songs aren’t much to go for either. Green sleeves is definitely free song material, but it’s a VIP song. Maybe don’t spend your whole budget on Instagram marketing. Desconta 4,99 sem vc autorizar. Without constant prompting to buy, this would be a great app. People who have value for the features will certainly buy. No need to keep nagging. Hi I like your game that you made it’s really cool! I’ll try to play it everyday but I have school but when I get home I’ll play it I hope you like this message! I only played one song and I’m already addicted. It’s easy to play and it helps with hand/eye coordination. Good for parents to get for their kids. No puedo creer que exista todo esto en la modernidad de estar mundo, me place mucho tocar batería con esta aplicación! This is a pretty cool app, but I am failing at performing. Nonetheless, I enjoyed the music and the effort. The app is very attractive visually also. Charged after I cancelled. Scam. I downloaded it, not realizing it was a subscription but kept it for a couple days. I then deleted it and cancelled the subscription before the seven days was up. I was still charged $7.99 on two separate days two days apart less than a month after I downloaded it. This app is garbage. We got a trial, which didn't work as advertised. Somehow we KEPT GETTING BILLED with an automatic subscription which we HAVE NEVER USED! Nor could we find the app to cancel it. BANDITS! DON'T GIVE THEM YOUR BUSINESS! Great game for music lovers. This app is not colorblind friendly. I have been a drummer all my life and was so excited about this. Until I found out... It pushes purchases and money and it costs 7 DOLLARS PER WEEK if you want to pay for it. The songs are awful. Everything requires VIP. They market it as a “free app” but it’s a lie. Horrible idea. Horrible greedy idiots designed it. Stay away. You can’t do anything except the tutorial the rest costs money it might as well cost money. This app is very addictive especially for music lovers!!!!! Sorry but your game would be better without a flat subscription model and $32 a month is completely insane. How about give us something to try then purchase packs of songs. Or encourage playtime to unlock more content. Sorry, but I refuse to even try a game that tries to rope me into a subscription that they hope I forget about. Won’t let me do free version. Just keeps opening App Store to pay. 32 dollars a month? That’s a no thank you. 7.99 a week seems a tall order to play. That is essentially 32 dollars a month to play. When I choose the ‘continue with limited version’ link it does not play. It merely loops back to the purchase screen with it’s two week trial. Is that the chosen length of time before a person supposedly forgets they subscribed and blindly pays out? Looks like a fun game. I’ve never played drums. Definitely think over time this app would provide that tool. You can’t even get into the game without being told that you’ve gotta get the premium edition. I looked at the reviews and all the 5star reviews were just bots to make the game look good. All it is are ads. If you don’t buy the $7.99 a month version. You can’t really do much. Please read. I downloaded the game and I read the terms and stuff thank it brought me to a screen were I couldn’t get out of it read “ 7.99 free trial” I wanted the normal version but it wouldn’t let me. I like the game’s concept. I’m even willing to pay to play. However, I’m not willing to be forced to sign up for an $8/week subscription that auto-renews after the trial, before even playing a single song. If they come out with a model that I can at least play a few songs with no commitment or worry about cancelling a subscription before the trial ends, I’d love to try it. That’s what in-app purchases are for and I’m fine with that. It’s a great way to let people try it out without being so over the top like you are. In its current form, this is far too predatory for my liking. Unfortunately that means they won’t get paid from someone willing to pay for the game without feeling preyed upon. Stop being so aggressive and abrasive and I’ll happily give it a try. The game has potential. It’s like any other guitar hero/rock band type game. The reason for the 2 stars is the song selection is down right terrible. The vocals on some of these people omg. It’s terrible. There’s also nothing challenging about anything on here. Put some more work in to it and I may try it again. Not worth the 7.99 a month price AT ALL. if this game is ever made decent I would still NEVER pay a monthly subscription for this. It’s really interesting but uses too much data. I love it so much despite the data usage. Drums are not in sync with music. Honestly i don’t ever write reviews so the fact that this one was so horrible necessitated a review. They are predatory and require you to sign up for the “free trial” which automatically enrolls you in the $8 A WEEK version of the game. And you cant unsubscribe through the app, you have to go to the app store. The game play itself would be just ok for a free game. But the songs are not good and as a musician i cant believe how non musical it sounds. So PLEASE dont do this. Go buy a Cajon and learn real drumming technique. Game is pay to play unless you like playing 3 songs but that’s understandable. I shouldn’t have to watch 2 different ads to play one song. Saw an ad for this game and thought it looked fun. I can’t even play the game without a pop up telling me to get the premium version. This is awful. I couldn't even try the game. Everything I pushed, including the continue with limited play, brought up a screen wanting my password and payment of $7.99. No thank you. I've already deleted this "game" from my phone. I'll stick to my real drumset. It lets me play without having to swipe my credit card. Haha! I COULDN'T EVEN GET INTO THE GAME. Okay I saw a playable ad for this game and it looked super cool, right? So I get it not checking the reviews as I should have and right off the bat this stupid app is basically forcing me to pay money if I wanna play this 'FREE' game! So I can't even play! What the heck?!! DONT DOWNLOAD THIS UNLESS YOU WANNA WASTE YOUR TIME AND MONEY. If I could give zero stars, I WOULD. It won’t let me play the limited version. Just keeps sending me back to the App Store to pay $8 a week for this game. That is over $400 a year. Completely nuts. Too many ads, ads too long, sometimes two ads between playing. The song times are way too short as well. Everything is geared toward you paying $7.99 per WEEK (that’s right, I said week). So we absolutely have to submit to the trial? Won’t let me play limited version, trying to rip me off at the start, try getting someone hooked on the game first and then try to f#%ck them! DO NOT DOWNLOAD THIS APP!!! It’s a terrible scam app that is worthless. They won’t let you even try the app until you pay $7.99/week and pay $1.99/song, which is an absolute joke. The song selection is crap and so is the drum kits. Being a drummer I thought it would be really fun. Game is just ok. The real problem is the annoying number of ads. I get that this how the developers make money, and I’m totally fine with that, but the frequency in this game is over the top. I was prompted after each game to write a review, also way over the top annoying. Deleting game now. My kids downloaded the free version which was cool but limited. After a while the add for 7 days free trial to have access to the full version started poping up then I deleted the app so my kids won't mistakenly accept it. Few weeks later I noticed that my account has been charged. I called my bank reported the unauthorized charge. A new card was sent to me in a mail. Funny thing is that I have not even updated my new card with iTunes and WeDrum charged me twice. I want my money returned to my account asap! You’re kidding right? $7.99 a week!!! $7.99 a week?!?!? Are you out of your minds? I’ve played games that bombard you with advertisements and hard pushes to pay for premium but this is by far the worst one I’ve ever seen. Absolutely disgusting. I also question the 4.4 star review. All I see is 1 stars. Never even got to the game. 10 minutes of ads and promotion for the premium version. Screw that. $7/week subscription?! To hell with that. Save $14 a week and buy yourself a real drum kit in a year. Waste. Of. Money. Who in there right mind would pay $40 a month to play a game on their phone. Unbelievable!! As the title says, you can’t even start the game until you turn down a couple times of them asking you to pay for premium but get a free trial first and bypass it. Then you play a test beat and get a 20 second song and then everything else is premium only. What a shame. Terrible experience. Right out of the gates they force you to authorize your credit card. Also - who in the world would pay $40/month to play a game on their phone??? Doesn't allow me to pass through a page until I subscribes to a trial. Horrible. Theres also a bug in the game when you paused a song in the beginning, the music will keep on playing and when unpaused the beat will be off sync. Don’t waste your time ! $7.99 per WEEK SCAM ALERT!! BE VERY CAREFUL, this scam charges $7.99 a WEEK and attracts kids to load to their phones. Pretty Sad to treat your users like this. Couldn’t even play it before Them nearly forcing the premium down my throat. Couldn’t even play a single beat... pretty sad. $40/month... now that’s deserves a cymbal crash!! Free to download and they generously give you 7days free. Then you are charged $9.99 per week. What a rip off. Inadvertently induced me to open membership, garbage. Way to many ads. Stay away until they fix that. It’s alright. Could be better. But I’m not an app developer. Gave it a shot. Good game but pushes the premium so hard it ruins it. Removed! Why does it say free and before you can ever open it, it tells you that you will be charged mi way after a 7 day trial. Obviously, it is not a feee item. I spent 10 minutes with this app. 1 minute was a cool rhythm drum game that I really enjoyed. 9 minutes were ads, pop ups to sign up for the paid version, more ads, and a frozen home menu. Cool game, but unplayable. Give the people a chance to play before they spend 8 bucks a month to subscribe!! You guys better not charge me. 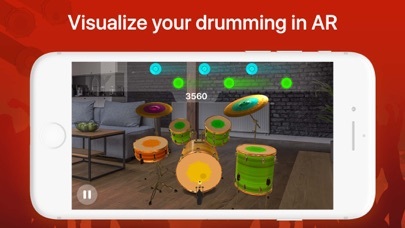 After downloading this app and opening it to play the drums for a minute, my App Store was forcefully opened and in attempt to get through to play it appears purchase was accidentally made for app extras. This is not a good look, an app should never force in app purchases especially when initially opening after downloading. Just installed. Got asked to rate about 10 times in first 5 min. Annoying. Song list limited. Uninstalling. So many ads you can’t even play a full song without stopping! DO NOT DOWNLOAD THIS GAME!!!!!!!! Not free. Not even “freemium”. $7.99 a WEEK just to open the app. Couldn’t even play the game without agreeing to a 7-day free trial that automatically signed you up for a subscription that was $8 a week after that. No, thank you. I’ll continue enjoying my actual free games. Thanks. 8 bucks a week? And you don’t even have full songs. Weak. So Cool Far Out Man!!!!! It may be free here. But it’s making me pay for everything. Can’t believe this app is billed at $7.99 per week. Premium Version premium Version premium Version premium Version premium Version premium Version premium Version premium Version $7.99 $7.99 $7.99 $7.99 $7.99 $7.99 premium Version premium Version premium Version premium Version $7.99 $7.99 $7.99 premium Version premium Version premium Version $7.99 $7.99 In case any of you were wondering what this game is like.... that’s pretty much it. I am seriously amazed Apple didn’t punish the developer - pure scam. You never get any new songs. I canceled my subscription twice and has still been charging me. Stay away from it. It isn’t nearly fun enough for the hassle. R & B, also neo soul and old school soul ballads, l think you’re be surprised how universal these genres are. Asking for a review after each attempt to play a song (including the very first), I am not too terribly impressed. Still learning the app, it appears the “timer” line above the score line (no “line” visible). Great, like it, very creative. Like to play the drums and the sound is great too. It doesn’t allow me to play even limited version, and request me to pay for unlimited version to get started. 7.99/week for me is a little bit high for a game that I just want to try, sometimes for relaxing, maybe only play few times a week. Uninstalled. So I just got this game a couple of minutes ago to try it out because I thought it looked interesting. Turns out I can’t even play it without having to accept the free trial. So this is a horrible game and I recommend you don’t get this app. EVER!!! You can cancel it at anytime it says but I hate that they force you to set up a subscription. So many people won’t realize that and will get screwed over because of you. How do I get the past the paid part at the home screen? 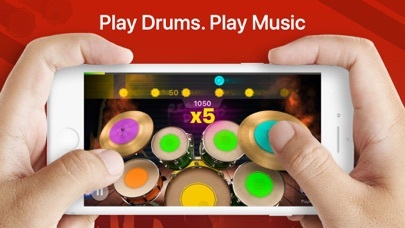 Way too f**king much for a drum game - I cancelled the app completely. Nice Game , Waste to lose it so fast. I downloaded the app thinking it would be fun but when I downloaded the app said I had to pay for unlimited access. I’m very disappointed. I hope this can be fixed. This app game is nothing but an ad machine. No decent tracks, stupid unintuitive interface for the kit, the drums you hit don’t even make a sound when you hit them like the in the IG ad. And when I started the app the first time I had to quit the app and restart to avoid paying for premium. I thought I would try it out but couldn’t get past the auto subscription for what looked like $8 a week. Are you freaking kidding me? No thanks. $7.99 a week for this app is ridiculous honestly. It’s more than a Spotify or iTunes monthly account. I get that they have to pay the artist to use their songs but paying $32/month just to play a game? Limited Tria... just kidding. We want you to pay. Would love to see what this game is about. If my kids ever found this app, I’d be paying $8 per week! Gimmick! The ads make this unplayable. It could be cool but constant ads and pushing of the premium version makes the game almost unplayable and unenjoyable. There’s also annoying unnecessary sound effects when you hit a multiplier, and an extremely limited song selection for the free trial and probably premium too. Not worth it. I just want everything to be free WITHOUT premium, WITHOUT in-app purchases, and WITHOUT interruptions! It implies there will be lots of songs ,but then it wants over 7$ a month! I could understand charging a few $ to get 4 more songs day for a year. Then $ for more and more songs ,if you want . It’s fun to play with though. Honestly, I’m sick and tired of companies who FORCE you to do a “free” trial of their app ONLY to then have to pay for it. It’s a drum game, it’s nothing special so WHY they think charging $7 a month is okay, is beyond me? Y’all think you’re out here changing the game. You’re not. It’s simply a scam and the fact that I can’t even play the game without having to connect my card to your app is a major turn off. Maybe learn better business cause I can assure you I know better than you. Miss me with your copy and paste BS response, don’t even @ me just fix your horrible attempt and tying to get everyone’s money in your pocket. You can’t play the non subscription set. The button keeps sending you back to the subscription page! Rip off!! Don’t waste your time. Don’t download this app because you have no free trial without registering to be billed after a week. i read some reviews before installing this app and i saw that they were all saying that the app was bad, and that it asks you for money all the time, and i was like okay, let’s see how bad it really is. i open the app once it finishes installing, and it doesn’t even let me play before asking for money. i tried to bypass it, and i couldn’t even play the game! when it asked me the only option was “continue”, and whenever i pressed it it asked for my touch id to confirm my subscription to premium. i never said i wanted it in the first place?? Can’t even try the “free” version without subscribing to the whopping $7.99 a WEEK subscription!! What a crock!!! Download & deleted right away! I can’t even review the app because the developer didn’t even allow me to try it. Don’t bother with this app!! Please move on to better things!! I was just trying to open the app, and then the premium came up after I had tapped “Ok,cool.”I assumed that it would’ve just been putting your I’d/password into the app...I was wrong, and so I realized that it was “Premium” and it did not let me get out of that section.So I proceeded to start judging the app thinking...”What kind of app just makes you pay for it inside...?”And I was both felt ripped off and confused.I was like,”I’ll just delete the app...”But I decided not to, and cluelessly pressed the button like an IDIOT.And I think I was charged. So, not only that but it is WAY to fast for me!I take another for that because I am extra, and I got ripped off.